It not unusual for a political theory and ideology such as Isocracy to be asked what individuals are inspirational or aligned to its point of view. To some degree caution is justified as (a) no single person agrees with everything that is proposed on the Isocracy pages (and vice-versa) and (b) often the person is deceased so it is perhaps a little unfair to claim their association without their consideration. At best one can go through the available works of a person and do a comparison. Nevertheless, as part of a series an attempt is made here to propose several individuals from the past who could be considered "at home" with the Isocracy Network. One such person is Albert Einstein. Whilst most famously known for his cosmological studies in general and special relatively, he was also a person he commented a great deal on the social and political affairs of the day, rather than let his specialist field entirely dominate his world experience. Perhaps in a different forum, one could also consider his even more extensive commentary on religious philosophy. A public opponent of the first world war, when many other intellectuals - including and especially social democrats - encouraged nationalist chauvinism, he was one of the founding members of the social liberal German Democratic Party and a participated in the League against Imperialism in the 1920s. Those two organisations, it must be mentioned, as examples of terrible political failures; the DDP disolved into the right-wing Deutsche Staatspartei which supported the Enabling Act of 1933 which allowed Hitler to rule with plenary powers and the League was effectively controlled by Comintern and was eventually dissovled in 1936. Einstein, at one stage the League's president, had already resigned. Despite these difficulties one finds many instances in Einstein's work which would concur with the positions expressed in Isocracy; indeed the ideas of Einstein has contributed to those positions. He was stridently opposed to nationalism and any notion of racial politics: "I do not believe in race as such. Race is a fraud. All modern people are the conglomeration of so many ethnic mixtures that no pure race remains" and "Nationalism is an infantile disease. It is the measles of mankind" . Einstein was also responsible for initiating the International Rescue Committee, providing emergency rescue and support to refugees from dictatorial regimes, a body which continues to this day. He was a cultural and labour Zionist, supporting the idea of a Jewish homeland in Palestine, but was particularly opposed to the establishment of a Jewish state, condemned the actions of the Deir Yassin massacre in 1948 as being akin to the behaviour of "the Nazi and Fascist parties", and rejected an offer to become Israel's second president; "I am deeply moved by the offer from our State of Israel, and at once saddened and ashamed that I cannot accept it." 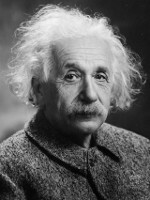 With his new American citizenship, Einstein attacked the mistreatment of African-Americans and became involved in civil rights organizations, such as the Princeton chapter of the NAACP and provided direct assistance to civil-rights activist and entertainer Marian Anderson, joined the campaign against the false murder charges following the Tennessee race riots in 1946, offered to be a character witness for W. E. B. Du Bois when accused of being a Communist spy, and joined Paul Robeson's 'American Crusade to End Lynching'. Perhaps even less popular at the time than his advocacy of racial equality, Einstein was also a signatory to Magnus Hirschfeld's petition against Paragraph 175 of the German penal code, which criminalised homosexuality. In international affairs, Einstein was an advocate for compromise, cooperation, and demilitarisation. It is very true that he argued for military preparation proir to WWII and encouraged the development of the first atomic bomb, concerned at Nazi Germany's developments in that direction, but after the war argued for a supranational body, such as the United Nations, to manage all atomic energy and security systems. With fellow luminaries Albert Schweitzer and Bertrand Russell, Einstein lobbied to stop nuclear testing and the development of future nuclear weapons and was a signatory of the Russell-Einstein Manifesto just days befor his death. In the field of political economy, Einstein spoke very highly of the site-rental theories of Henry George, stating that: "Men like Henry George are rare, unfortunately. One cannot imagine a more beautiful combination of intellectual keenness, artistic form, and fervent love of justice." But he went further than this; George was an advocate for the socialisation of economic rent, but otherwise supported private ownership of capital. Einstein even went beyond the social liberalism of his earlier days and what would become Ordoliberalism, which supported capitalism with welfare and regulation. Instead Einstein, was an advocate of abolishing class society ("I regard class differences as contrary to justice and, in the last resort, based on force") and argued for socialism as his famous essay, "Why Sociaism?" , in the inaugural issue of Monthly Review, made explicit. In this essay Einstein initially notes the historical establishment of the state and class society through land ownership and criticises the suggestion that economics can be treated like other sciences, as its general laws require an ethical end, which differs from pure factual positions. Quoting Thorstein Veblen, Einstein sees the socio-ethic position of socialism as an end state which can overcome "the predatory phase" of human development. The limiting factor is: "The economic anarchy of capitalist society as it exists today ... the real source of the evil." It is this 'evil' that sets humans in conflict against each other, "a huge community of producers the members of which are unceasingly striving to deprive each other of the fruits of their collective labor", noting that workers do not receive the value of their contribution to production, that the capitalist seeks to lowers their wages, and that private capital tends to become concentrated due to competition, technological development, and the division of labour. This concentration leads to an oligarchy that is even more powerful than democratic political institutions. Whilst there is a wealth of material on where Einstein emphasised the enormous importance of socialisation and the interdependence of the indvidual, politically he was committed to individual and personal freedoms, both in the negative and positive sense. He was certainly an advocate of freeedom of expresison: ".. freedom of communication is indispensable for the development and extension of scientific knowledge, a consideration of much practical import. In the first instance it must be guaranteed by law." Complementing negative liberties, such as freedom of expression, he also advocated a strong social welfare system: "Social equality and economic protection of the individual appeared to me always as the important communal aims of the state". The combination of the two creates the conditions of true creativity: "Everything that is really great and inspiring is created by the individual who can labor in freedom". One may readily refer to Hannah Arendt's equivalent position in her conception of free "action", as distinguished by "labour" (pure survival) and "work" (wage employment). In terms of implementing political change Einstein, apart from active involvement, supported the strategy of non-violent direct action as emphasised by Gandhi. "Taken on the whole, I would believe that Gandhi's views were the most enlightened of all the political men in our time. We should strive to do things in his spirit... not to use violence in fighting for our cause, but by non-participation in what we believe is evil." Lest one think that his advocacy of military preparedness in the lead up to the second world war and the development of nuclear weapons was entirely in contradiction with his self-description of "I am not only a pacifist but a militant pacifist" , it fairly clear that he did not consider himself an absolute pacifist. This position was of course varied by Einstein's political orientation; he loathed the Nazis absolutely, but in advocating conciliation during the cold war, it suggests that he both supported the socialism and communualism advocated by eastern bloc, and the democracy and personal freedoms advocated by the west. Certainly, he was no alone in this attitude. With very minor differences, it is fair to suggest that Einstein could have found a political home and support the objectives of the Isocracy Network. With his dedication to evidence, a desire to reduce apparent complexities to more simple principles ("the left side of the equation"), a commitment to individual liberties, and equal rights, to political democracy, and the social ownership of the means of production - there is all simply far too much in common to think otherwise. Certainly there is more agreement in the core political positions of Einstein and the Isocracy Network than there is with any other political ideology. For that reason, the bold conjecture is made - Albert Einstein was an isocrat. It is indeed a shame that he is not present to confirm this, and all we have is his words to infer such an association. But as he said : "People like us, who believe in physics, know that the distinction between past, present, and future is only a stubbornly persistent illusion." . Commenting on this Page will be automatically closed on August 12, 2015.